Captions: Top: View of Sutherland Wilson house, with the barns in the background. Captions: Right: (1) The main beam in the basement of the house is hand hewed out of solid walnut -- 10 inchs wide by 7 1/2 inches thick. 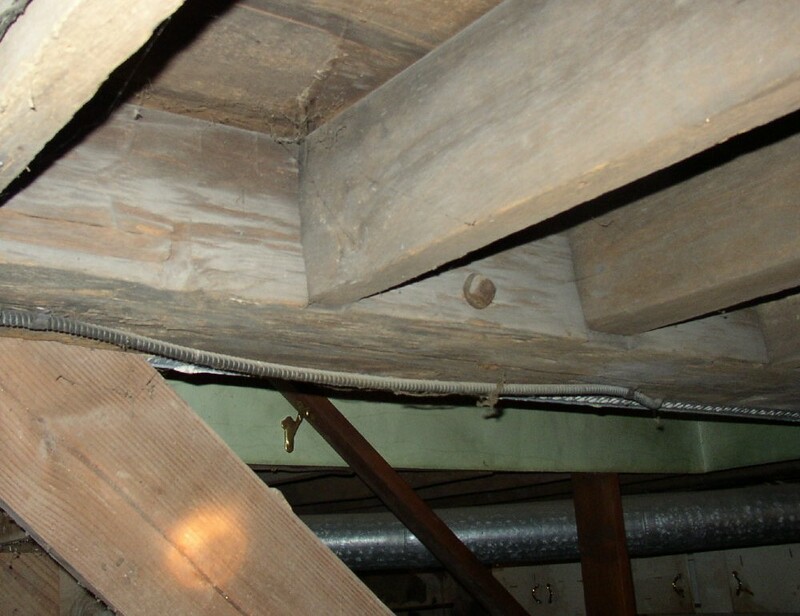 The floor joists are notched into the beam 4 inches to fit level with the floor. These also are solid walnut 2 inches wide by 7 1/2 inches high. (2) Equipment shed. 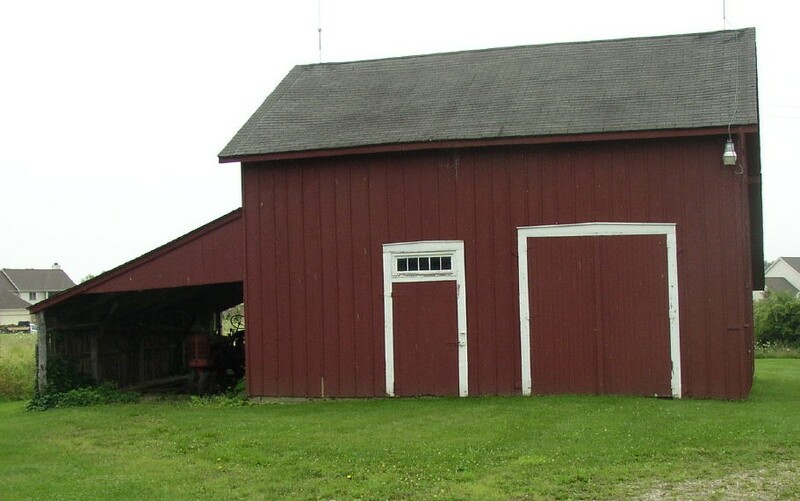 Note the old tractor under the roof at the left side of the image. Click images for larger versions. The Sutherland-Wilson house is located between State and Lohr Roads on the south side of Textile Road in Pittsfield Township. A centered, half-length porch with a half-hipped roof leads to the main entrance door which is flanked by sidelights and topped by a row of dentils under a wide entablature. Six-over-six window lights contain, in many cases, the original glass. The house is sided with white clapboard and supported by a stone foundation. A layer of handmade brick serves as insulation behind the clapboard on all the exterior walls. A chimney is located on the east wall of the cottage unit which is adjacent to a side addition; the addition contains a central chimney. A brick chimney flue of smaller dimensions than the originals was added at some point to the exterior wall at the west end of the one-and-a-half. In addition to the sidelights, entablature, and dentils, Greek Revival detailing includes molded cornices and returns, five frieze windows on the facade, three frieze windows on the south elevation, and the four porch columns. The two central columns are fluted and of the Doric order, and the two outside columns are square. The east and west extremities of the porch are marked by plain square pilasters which match the corner columns. The one story addition, which originally served as a kitchen, was added to the eastern side of the house around the turn of the century. It was constructed in keeping with the style of the main unit with molded cornice, raking and frieze boards, returns, and three frieze windows on the rear elevation. This addition originally had an open quarter-hip porch with columns and entablature; this porch is now enclosed. The drop wing now functions as a one-bedroom apartment. A rear exterior porch was enclosed in 1974 and now serves as a utility room. Interior details include Greek Revival paneled moldings with corner blocks (also with recessed panels) around paneled doorways, apron panels under the living room windows, wide footboards, and a marble fireplace which, according to the owner, is original, built by a family cousin named Witherspoon. Within a large framed opening, original tapered columns divide the front living room from the rear dining room. An apron panel is located under the columns on each side of the opening. The frieze windows in the second floor bedrooms open by sliding into the wall. The interior floor plan and room functions have been altered over the years. The central hallway is flanked by a large combination living and dining room on its east side and a bedroom and kitchen on the west side. The room now serving as a living and dining room was once used as a parlor, and the first floor bedroom was likely a sitting room. At one time, the central hall probably extended the entire length of the home, but in 1958, a bathroom was built behind the open stairway. The rest of the central hall still remains and contains the original cherry wood staircase and a chandelier. The second floor carries out the original floor plan with one large bedroom on each side of the staircase. Much of the original detailing of the home has been preserved. The house evidently remained in its original state for well over a hundred years. Plumbing and electricity were not installed until 1958, and the chandeliers in both the dining room and entrance hall were originally fueled by kerosene. The Sutherland House is significant as one of the best surviving examples in the county of the synthesis of a New England tradition one-and-a-half cottage with a central hall version of the New England plan and Greek Revival stylistic expression. It is also significant because of its historic association with an early pioneering family, the Sutherlands. The Sutherland house is a fine example of a one-and-one-half New England cottage in the Greek Revival mode, appearing to be somewhat larger than the average. The dwelling is representative of the synthesis of folk house form and stylistic fashion which occurred in the transitional period when folk housing traditions were being supplanted by national house types. The combination of Doric columns and square columns on the front porch is unusual as well as illustrative of the syncretic character of the house. Although the interior floor plan has been somewhat altered, the Greek Revival door surrounds, the large, "columned" parlor, and the extant central hallway and cherry wood staircase appear much as they did at the time of construction. The house is also significant as the home of Pittsfield Township pioneers, Langford and Lydia Sutherland. Langford Sutherland was born in Ontario County, New York in 1802. He came to Pittsfield Township, Washtenaw County in 1832 with his wife Lydia and two children. It is known that he first built a log cabin and then the house, although the exact date of construction has not been determined. The Sutherlands raised a large family of at least eight children. Langford Sutherland died in 1865. This property was designated a Centennial Farm in 1981. Through his mother, Mr. Harold Wilson, the present owner, is a direct descendant of Langford and Lydia Sutherland. His son is the sixth generation of Sutherlands to live in the home. El/2 of NE l/4, EXC l0 ACS DESC AS BEG AT NW COR OF E l/2 of NE l/4, TH E 20 RODS IN N LN OF SEC, TH SW'LY TO THE SW COR OF E l/2 OF NE l/4, TH N IN W LN OF E l/2 OF NE l/4 TO POB ALSO EXC COM AT N l/4 COR, THE E IN N LN 1659.91 FT TO POB, TH N 89-30 E 208 FT. TH S 06-55-40 W 2134 FT. THE S 89-30 W 208 FT, TH N 06-55-40 E 2134 FT TO POB SEC 29 T3S R6E 59.90 AC. Washtenaw County Department of Planning and Environment. "Combination Atlas Map of Washtenaw County, Michigan." Reproduced by Windmill Publications, Inc. Mount Vernon, IN, 1991. Reprint of "Illustrated Atlas", Chicago: Everts and Stewart, 1874, 1895 & 1915. Washtenaw County Department of Planning and Environment. "Washtenaw County Michigan Plat Maps l856 and l864". Ed. Nancy H. Krohn and Mary L. Liskow. Reproduced by Genealogical Society of Washtenaw County, Michigan, Inc., Ann Arbor, MI: 1997. Reproduced from Wall Maps published by of Bechler and Wenig 1856, and Samuel Geil 1864. Interview with Mary Wilson, November, 1984 and February, 1985. Charles C. Chapman, History of Washtenaw County, Michigan. (Chicago: Chas. C. Chapman & Co., 1881), p. 1272.